Deciding to move your baby into their own room is a big step! There are so many questions you may have about moving your baby from their cribb or your own bed into a bedroom of their own. What is the best age to move baby into their own room? Will baby sleep better in their own room? What is the best sleeping enviromnent for baby? These are just a few of the questions you may have. 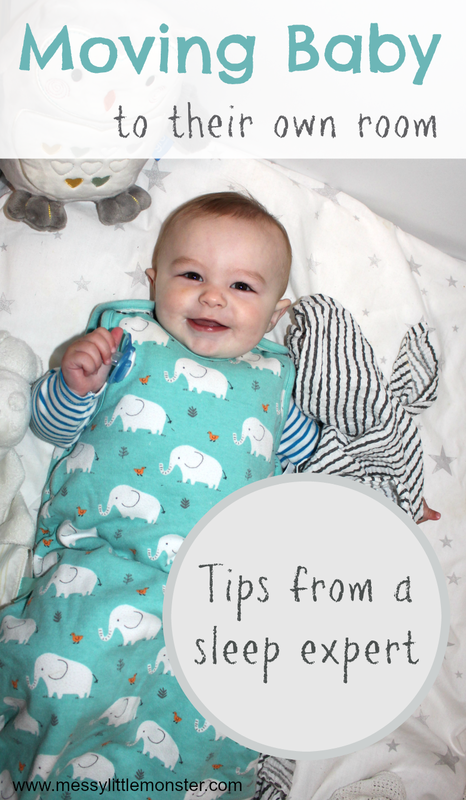 To get answers to some of the most asked questions about moving baby to their own room we have Lauren from Little Sleep Stars with us to give us her top tips! We have recently moved Oliver (7 months) from his cribb next to our bed into his own bedroom. We found moving him a really big step, partly because it suddenly makes him seem more grown up and we miss having our little baby beside us, but also because (even after 2 other children) we have worries about making sure we get it right! Below you will find some really useful advice that we have been following from 'Little Sleep Stars'. 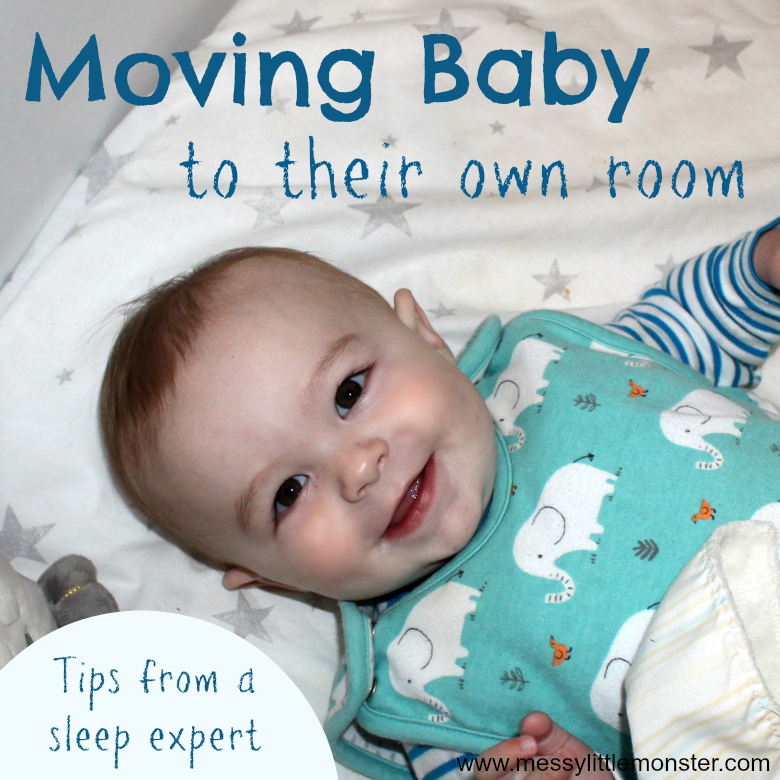 Hopefully these tips will answer a few of the questions or thoughts that you may have about moving your baby into their own room. Historically parents have been advised to keep their baby in the same bedroom as them, but in his own bassinet/crib etc, for the first 6 months. The reasoning behind this is that room-sharing appears to be protective against Sudden Infant Death Syndrome (SIDS). Quite why it has this effect isn't yet known exactly but the American Academy of Paediatrics recently began to advise that for the maximum protective benefit, little ones should room-share for at least the first 6 months but ideally the whole of their first year. Parents have to do what is right for their family but anyone not feeling ready to move baby at the 6 month mark shouldn't feel any pressure to do so - room-sharing beyond the first 6 months is not a bad thing, rather it has a continuing protective effect. It is worth noting that around 90% of SIDS deaths occur before babies reach 6 months. Many parents decide to move their little one as they assume frequent night-wakings are being caused by them disturbing their child's sleep. All babies beyond about 4 months old, all people in fact, wake in the night - it is a normal biological function designed to keep us safe. Rousing anywhere between around three and five times in the night is utterly and completely normal. The issue with little ones generally isn't that they wake, it's that many haven't learned how to get back to sleep without help from their parents (usually in the form of feeding or rocking). Moving a child to their own room won't stop them needing that help. Of course if one parent is a loud snorer that legitimately could be disturbing a little one's sleep, especially in the second half of the night where children spend more and more time in light sleep. Typically the best sleeping environment for a little one is somewhere that is calm, quiet and as dark as possible. Whilst cot mobiles can look pretty they can be stimulating/distracting, especially for those little ones with alert temperaments who are "into everything". Cots are best (and safest) when they are clear spaces, free from cuddly toys and loose covers. Cot bumpers are to be avoided on safety grounds - although if a little one tends to poke their limbs through the cot bars the breathable air mesh wraps can be helpful. Personally I'm not a fan of light projectors etc being part of the sleep routine as for a lot of children they seem to make falling asleep harder. Babies tend not to be afraid of the dark - the womb is pitch black after all and typically in the early months babies sleep best in womb-like conditions. Even by the time a child moves to their own room it is unlikely they would have acquired a fear of the dark and so I would always start out having the room as dark as possible. If parents do want to have a light on at any point, e.g. whilst feeding/reading stories etc then it's worth knowing that red bulbs are less likely to interfere with sleep than any other colour (amber bulbs follow in second place). Artificial lights, and even daylight, emit "blue" light which inhibits the body's production of melatonin which is the hormone which makes us feel sleepy. For this reason I always advise parents to avoid their little ones being around screens (TV, tablet, smart phone etc) for at least an hour before bed (ideally two). This includes TVs being on in the background in the same room as the child. Once a child is settling down for sleep, if 10/10 is so dark you can't see your hand in front of your face then we ideally want it to be at least 8/10 dark. This is likely to require blackout curtains and/or blinds, especially at this time of year. Even if light isn't creeping in during the evenings, it is likely to do so in the early morning which can contribute to early-rising (where a child wakes for the day pre-6am). Sometimes parents need to be creative to fully block out daylight - the portable blackout blinds which attach to the windows with suckers can be a life-saver. Whilst a quiet room will promote the best sleep, many little ones find absolute silence disconcerting. Again it comes back to the womb environment which isn't silent - there is a constant level of white noise. Also, if a baby is moving from your room he will be used to a level of background noise and so a move to total silence might unsettle him. White noise machines are a relatively cheap solution for creating a constant low-level hum which many babies find comforting. In addition, white noise will soften any louder or more sudden noises (think dropping something on the bathroom floor next to your baby's room!) and can help a little one sleep through household noise and/or the sound of birds tweeting away before you want to be up for the day. It's worth noting I'm not suggesting parents need to invest in one of the increasing number of in-cot white noise devices - whilst these can be great, a basic white noise machine or even an App playing on the iPad running constantly through the night will do the job. Bear in mind that if you do use an iPad it needs to be placed face-down to avoid it emitting blue light into your child's room! This can be a good point to introduce a nighttime comforter. A little one might not take to the comforter immediately and may ignore it for a good while but it's worth persevering as there usually comes a point where a child will accept and then find security from having a "bedtime buddy". Most parents dread the bedroom move! But little ones are often fine with it. When a child is young his parents are his biggest constants and often as long as we are around then environment changes don't throw them nearly as much as we expect. I always advise parents to be prepared to offer their child extra reassurance and support but not to automatically assume it will be needed. For example, if you usually put your little one down awake and they fall asleep happily without you in the room then the starting point is to do the same in the new room. If your little one lets you know he's not sure about his new environment then you can sit next to his cot offering reassuring words, touch and presence to let him know that he is safe. The following night try to scale back on the touch and possibly move a little closer towards the door. Within a few nights you'll be outside the room and your little one will be back to happily settling himself off to sleep. On the other hand if you have been feeding or rocking your little one to sleep before putting him down into his bed already asleep, it's logical that the change will be more noticeable for him as he will at some point wake up in a strange bed! 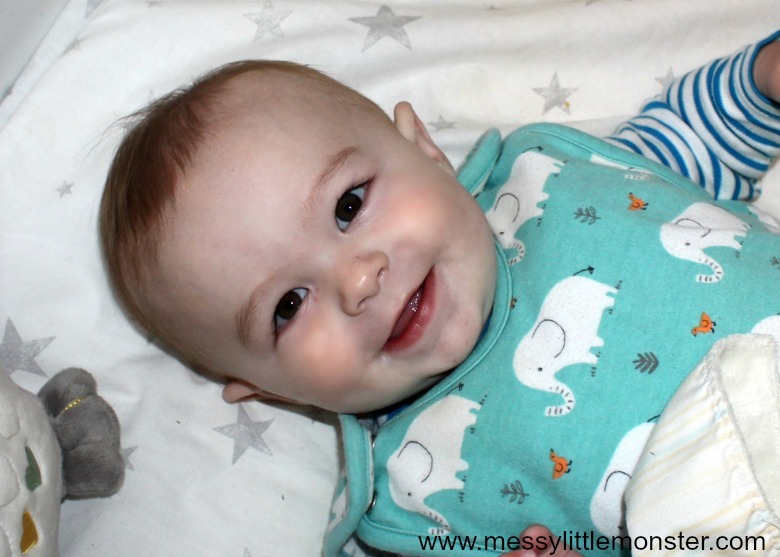 It's always worth considering whether baby's existing sleep space can be relocated to his own room - this minimises the number of changes happening in one go. The other option (which will yield better results long-term) is to work on your child's sleep skills before you relocate them so they are happy, content and and confident being placed down awake - ultimately that will avoid your little one being surprised when they find themselves in a new bed and save you multiple trips to their room to resettle them. I often hear of parents putting their little one down for naps in their new room for a week or two making the nighttime move. This period of "getting used to" the new room makes a lot of logical sense but napping is typically harder for little ones than night sleep. Whenever I start a sleep plan with a family we always start with bedtime as, whilst it won't always feel like it, it's actually the easiest time for a child to fall asleep. Naps are harder as a little one is working against their body-clock and environmental factors such as it being much lighter. For this reason I would make the move to the new room and bedtime and follow it up for naps the next day rather than leading with naps. You don't have to buy the most fancy version (and actually there's usually a bargain to be had secondhand) but video monitors can be incredibly useful. Babies move around a lot but they don't always need us to intervene. Some make a level of noise when transitioning through sleep cycles. If you only have the benefit of sound on your monitor it's very tempting to go in to check on your baby visually - it's a normal parenting instinct! But often it can disturb a little one who was simply repositioning. With a video monitor you have "eyes on" and can see whether your child needs you to go in and help in some way or whether they are just getting comfortable and settling back down to sleep. I'm often asked about whether a little one should be put into their cot during awake time to play and thereby learn to associate the space with fun. It's not something I personally recommend. Whilst of course we want a little one to feel happy and safe in their sleep space we also want them to associate it with sleeping! Even though the incidence of SIDS declines sharply after 6 months, parents should continue to follow the safe-sleep guidelines. I won't rehearse them here as most parents know what they are but for a refresh the Lullaby Trust website is a great resource.